Aki Kamozawa and H Alexander Talbot first met in Boston Kitchen in 1997 and have been cooking together ever since. Their blog, Ideas in Food, has become one of the world's most respected culinary blogs, combining solid information, brand new ideas for food and beautiful photography. 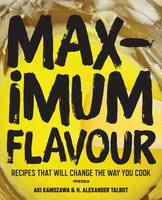 Their second book, Maximum Flavour: Recipes That Will Change the Way You Cook, features 125 original recipes that need only everyday ingredients and equipment. Their expert advice offers cooks in their own kitchen the chance to experiment, taste, play and discover again. Here they share their mouth-watering recipe for strawberry pie based on the recipe, Alex's grandmother, Kitty (pictured below), used to bake every Easter, with some insider tips on how to make yours come out just like Kitty's. Kitty's Strawberry Pie is one of our favourite recipes from the book. Kitty was Alex's grandmother. She passed away shortly after the book was published, and one of our favourite pictures of her is her holding the book. She made that pie every year for Easter. After Alex and I were married we took over making the pie. It's such a simple recipe, but it's essential to take note of the specifics so that it turns out just perfectly. Because it's essentially just berries and piecrust it's important that the berries are fresh and flavoursome and the crust is crisp and delicious. We use an all-butter piecrust because they taste better and we flatten the dough before rolling it out using a French technique known as fraisage to ensure flaky layers of dough. Cooked properly it's a crust that is good enough to eat on its own. the gel is softer and more tempting on the tongue. Finally we serve the pie with softly whipped cream. The key here is to use powdered sugar to sweeten the cream. It has a little bit of cornstarch in it and that helps stabilise the foam. This means your whipped cream will keep in the fridge so you can make it before the meal if you're so inclined, but perhaps more importantly, it means that any extra whipped cream will hold in the fridge without melting - so when that late night urge for pie hits you have everything you need to indulge! This Easter we'll be sharing the pie with our daughter Amaya and the rest of our family, and I'm sure we'll be raising a glass of champagne to remember the wonderful woman who created it. We hope you enjoy it as much as we do. In a food processor, combine the flour, sugar and salt and pulse 4 or 5 times to blend. Add the butter and pulse 2 or 3 times to blend. Pour the ice water into the food processor and run the processor for 5 to 10 seconds to bring the mixture together. If it seems a little dry, add more water 1 tablespoon at a time. The pastry will resemble small pebbles and hold together when you squeeze a bit in your hand. Turn it out onto a floured bench and sprinkle the top lightly with flour. Starting at one end, use the heel of your hand to smear the pastry into the bench in small amounts. Do this quickly, being sure not to work any section of pastry more than once. This technique, known as fraisage, forms flaky layers of fat and flour. Use a bench scraper or spatula to peel pieces of pastry from the bench. Gently press them into 2 compact balls of about equal size and flatten into discs no more than 5 cm thick. You can roll them out and use immediately or freeze for up to 1 month; alternatively, wrap the discs in plastic wrap to keep in the refrigerator for up to 1 week. Let the refrigerated pastry rest at room temperature for at least 30 minutes before rolling. Preheat the oven to 205°C. Line a baking sheet with baking paper. Roll the pastry into a round with a 30 cm diameter and line a 23 cm pie dish. Trim the edge so that there is a 2.5 cm overhang. Roll the overhang inward and tuck underneath the top edge so that it forms a log all the way around the pie dish. Crimp the edges by squeezing the dough gently between your thumb and forefinger, moving them all the way around the dish and pierce the bottom a few times with a fork. Put the pastry shell in the freezer while the oven preheats. Once the oven is hot, take the pastry shell from the freezer and put it on the baking sheet. Put a piece of baking paper inside the crust, fill it with pie weights and bake for 20 minutes. Remove the pie weights, reduce the oven temperature to 175°F and bake until the crust is a light golden brown on the bottom, about 30 minutes. Let the pastry crust cool completely at room temperature before using. Divide the strawberries into 2 piles, one half with the prettiest berries. Halve the prettier berries lengthwise and arrange them, cut side down, in the pre-baked pastry shell. Put the sugar and salt in a medium saucepan set over medium heat. Meanwhile, quarter the second batch of less beautiful strawberries. When the sugar becomes an amber caramel, carefully add the quartered strawberries. Cook, stirring, until the sugar melts and the mixture comes to a simmer. In a small bowl, mix the tapioca, cornflour and cold water together and then pour the slurry into the strawberries. Stir the berries as they come back up to temperature and cook until the mixture thickens and becomes glossy, about 5 minutes. Stir in the lemon juice. Remove the pan from the heat and let cool to room temperature. Spoon the cooked berries over the top of the layer of fresh berries in the pastry crust. Use a small spoon or rubber spatula to gently lift up some of the fresh berries and use a pastry brush to make sure that all the berries are glazed. Put the strawberry pie in the refrigerator to cool and set for at least 3 hours before serving. Cut into slices and serve with freshly whipped cream.